It's great to be back here and announce about the new update of Bind Mi Band which we were preparing during last weeks. Read below about new and improved things in this update. 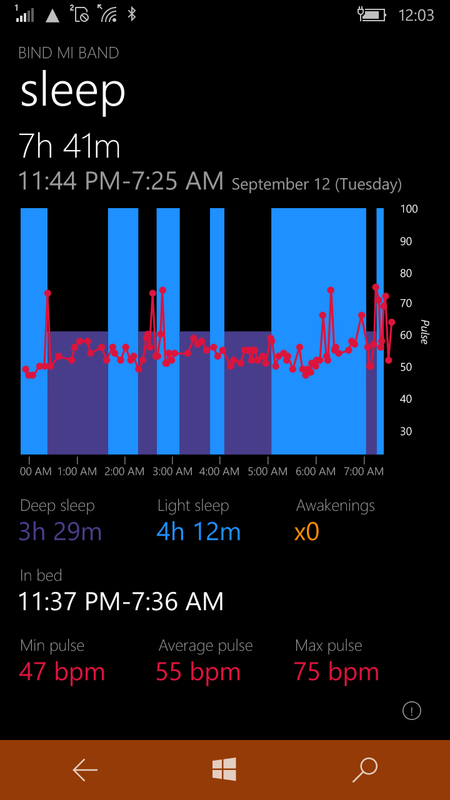 For band models with HR sensor, we have a setting to enable pulse measurements during the sleep for a long time now. But we didn't end up displaying the data in the app, because the measurements were very unstable, especially for Mi Band 1S. With Mi Band 2 we see that the pulse sensor works somewhat better, albeit still not perfect. Anyway, it was decided to try to show the pulse graph. 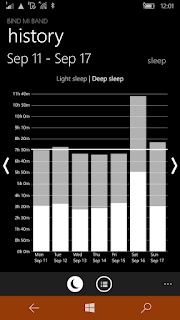 The results you will see on the sleep details page (when clicking on a sleep item in the list). Here is an example screenshot. 1) Mi Band is not a certified medical device. Do not use it if you have heart conditions. Consult your doctor and get a specialized equipment, it's not that expensive. 2) We smoothe the data and remove some data points because sometimes band gives extremely untrustable values. So you won't see pulse higher than 100 bpm in the graph. After reading numerous medical research and articles, it does not look probable to have HR higher than 80 bpm during sleep. 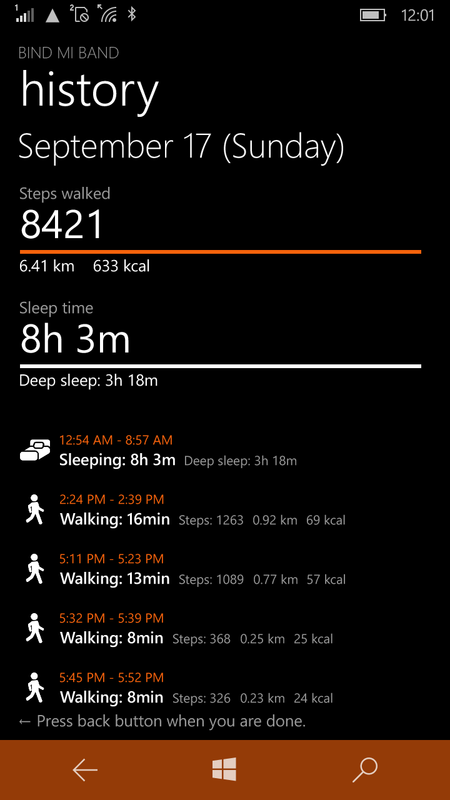 Raw numbers from Mi Band can contain such values and we discard them. 3) Our sleep phase analysis does not take HR into account yet since before this update we couldn't trust HR values anyway, as mentioned earlier. But we will improve on that. 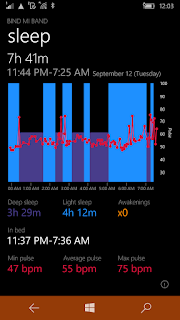 4) The band's firmware decides itself when a user has a sleep and when start to measure HR. 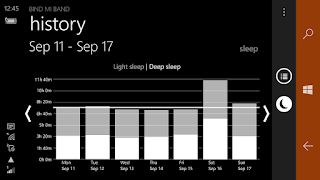 We run our analysis and can detect even more sleep periods, but they won't contain HR data. So, sometimes you might see HR data missing. 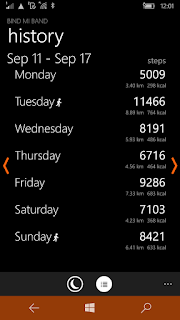 Many of you asked about this improvement and now you will see more information about calories and distance in the history both for weekly and daily view. Here are couple screenshots. Also, these values are synchronized in OneDrive too. The same thing for deep sleep stats in history: you asked - we deliver! Screenshots here look even more interesting. 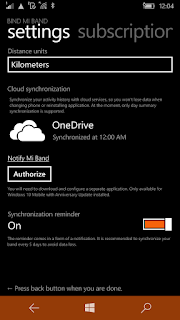 And this data is also synced in OneDrive, of course. There is a problem with Mi Bands and Windows OS. 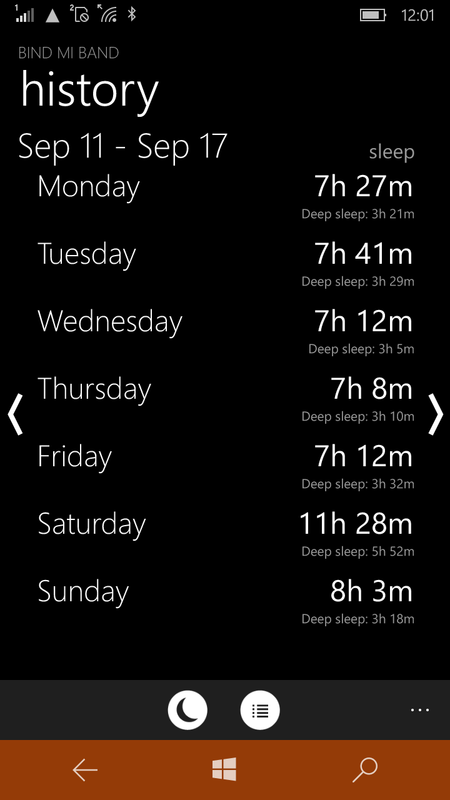 For some reason, after 7-10 days without synchronization, we can't receive all data from Mi Band. Low-level Bluetooth API on OS side starts to lose data chunks and we get an incomplete data package. We are trying to improve the situation here. Firstly, we introduced synchronization reminders. 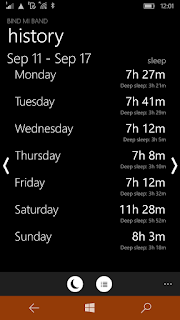 If they are enabled (and they are by default) you will start to get notifications after 5, 6, 7 days without synchronization to your Mi Band. 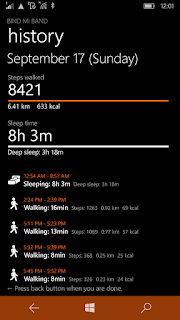 When you launch your app, we will quickly sync all your steps and sleeps and no data will be lost. Yay! See the screenshot of the setting here. Secondly, if we fail to fetch all the data several times, we will try next time with smaller interval (1 week or 5 days). In this way at least your latest achievements won't be lost. It's important to notice that this improvement works only for Mi Band 2. Firmware 1.0.1.53 is included for Mi Band 2. Shortly before the release, I noticed that there already was firmware 1.0.1.56 published with Mi Fit, but I wouldn't like to put all our users in risk with unknown fresh firmware. As always, if you want to know my position on this: if everything works well for you, don't update firmware and don't "hunt" for new firmware. It's very doubtful that there will be a "new cool feature". Some firmware is bad (usually, the default ones) and should be upgraded from. In our app, we include only what is considered to be stable firmware. We are constantly listening to your feedback and fix small things here and there. It can be a bug, but also a UX improvement like information/error message. For example, we get quite many support emails for a situation when the user changes their Mi Band but forgets to remove the old one in Bluetooth settings. So the app keeps looking for a previously paired band, but it's unreachable. Now you will see a message telling you to keep only one Mi Band paired in Bluetooth settings. So, please, leave your feedback on our email and you will be heard. It's a promise! It happened so that from the first release of the app it was locked in portrait mode. But we try to make our UI flexible, stretchable and accessible. So there were literally no problems to remove screen rotation constraint. 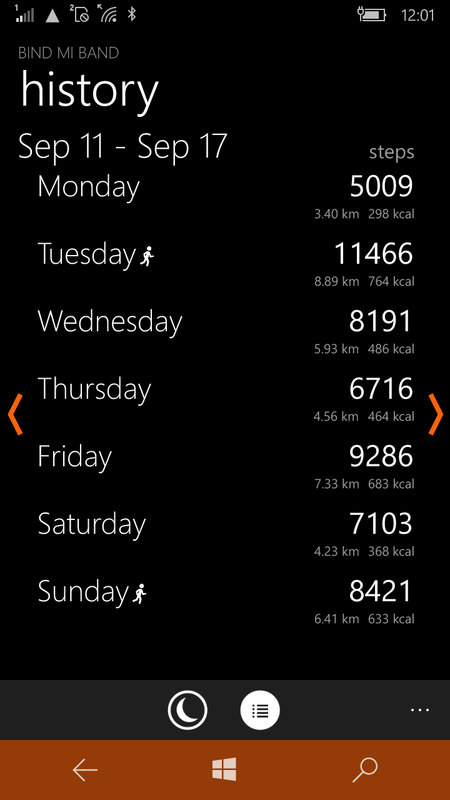 Now you can enjoy some of the graphs in landscape mode like on the screenshot below. Yay! That's all for now. Really hope that you like the update! If you want to praise the effort, leave a comment. Questions/suggestions/bugs - write us an email! Thanks to all our dear team of translators for a quick response and help on the localization of new strings. This makes the user experience of every one of us more personal. Are you still with me? If you have read to this line, congrats! It (was) a huge post, but we were not in contact for really long time, so today I want to share with you on my thoughts about the future features for "Bind Mi Band". Please, see another article, since this became too big and I split them. Love your work man, thank you! Great work. Keep it up guys! What does the walking/running man symbol represent next to a given day in the history? It appears only next to some days, and I can't figure what it means. It means that there was running that day. It is fantastic. Thanks to keep wp users updated! What is the Mi band 2i? Thanks for your stunning good work! I still buyed the full-version, it is every penny worth! I use it with my Amazfit BIP-Watch, all is working, execpt the Weekday is wrong (Today is Friday but the Watch showing Saturday).